Corn snakes are a popular pet snake for beginners, and it’s for a good reason. With the proper care they can easily thrive and become a beloved pet. Since these snakes have become so popular in the pet trade, as expected TONS of different morphs have popped up over time. Beautiful pinks, purples, and yellows, the possibilities seem endless. Today we’re going to pick 10 of our favourite morphs to show you, but if you want to see a part 2 (or 3!) comment below to let us know! To start off with, below is a photo of a “normal” corn snake for comparison. Lavender morph corn snakes are fairly self-explanatory. These beautiful snakes are various shades of a soft lavender, which is certainly a unique colour for snakes. Anery Palmetto Corn Snakes have a beautiful appearance. The corn snakes usual pattern is replaced with a brilliant white, with accents of light grey and dark grey patches along the bottom and on the head. Their eyes are also an icy white/blue colour, complementing the bright white of the scales. As far as corn snake morphs go, the butter morph is certainly a gorgeous one. As the name suggests, this morph is characterized by a beautifully buttery yellow. This colour is present all over the body, including both the top scales and underbelly. The yellow can range from a light pastel yellow to a darker buttery orange colour. Their eyes are similar to that of an albino corn snake, and have a distinct red/pink colour to them. Coral ghosts are another beautiful corn snake morph. This morph can be identified by the beautiful main colour of coral, with various blotches of grey that cover the snake from head to tail. The intensity of the coral varies, with the one pictured above being a very intense coral example. The granite corn snake morph is characterized by the main scale colour of greys and silvers, with accents of various browns and tiny splashes of yellow-browns. Their eyes are also a beautiful silver grey, adding to the gorgeousness of this morph. While the name of this morph can be a mouth-full, it is a good descriptor. 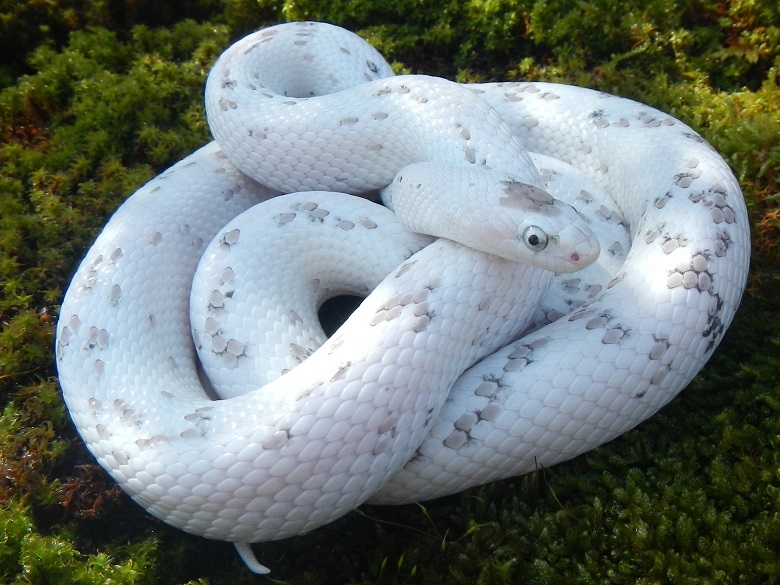 This morph has the obvious traits of pied, with white patches covering various spots over the snakes body. The bloodred is a pretty accurate description of the rest of the scales, which are bright red/red-orange and contrast extremely well against the bright white. This corn snake morph is called creamsicle due to the beautiful orange and white colours that make up the scales. The colour of the morph can range from slightly darker oranges, to soft pastel oranges, and creamy whites. This morph also has the reddy/orange eyes, similar to the ones seen on albinos. Strawberry snow is a dream come true for some corn snake lovers – a pink snake! These snakes have a beautiful mix of pastel pinks, and soft whites with hints of pastel yellow. Their eyes are also a beautiful pastel pink colour, matching perfectly with their pink scales. As of right now, the anery corn snake morph is the closest you’ll get to having an all black corn snake. And while this morph isn’t all black, they are still absolutely gorgeous in their own right. Their bodies are a mix of various blacks, greys, and soft whites and their eyes are a soft grey. The Anery morph is a base morph that goes into a lot of other morphs to give those morphs their stunning dark/grey colours. 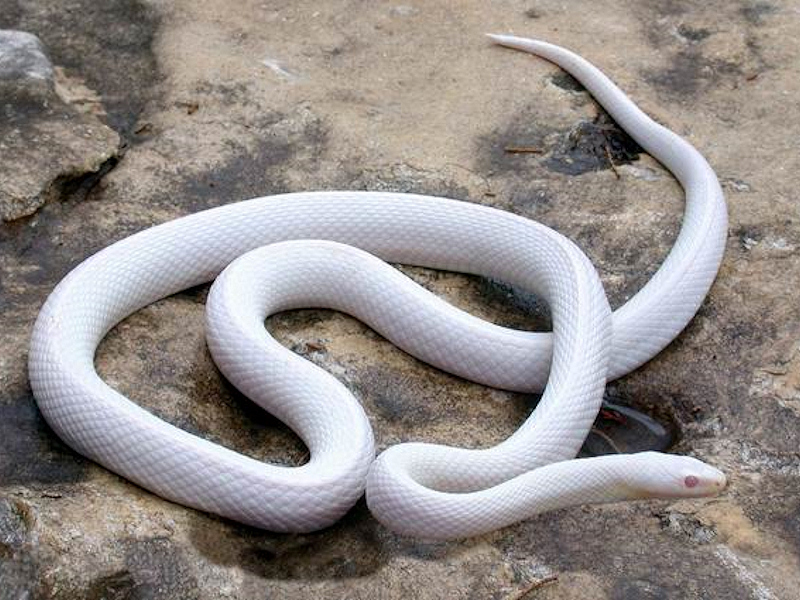 Not to be mistaken as albino corn snakes, the Blizzard morph is a stunningly bright white colour that covers the entire body, and the eyes are a gorgeous pinky red that contrast nicely against the bright white of the body. This morph is an absolutely stunning ending to this list. Enjoy this article? Share it with your friends using the links below! Also, leave a comment below and let us know what your favourite corn snake morph is. Thanks for reading!